But due to the title of this post there's gonna be a part 2: I used the wrong colours... the background of the dove should be LIGHT brown instead of the dark brown I used. So very very soon I hope to post part 2! After sewing all those little pieces I felt for something different: big blocks, no pattern and a little fantasy. I guess this is creazy quilting! 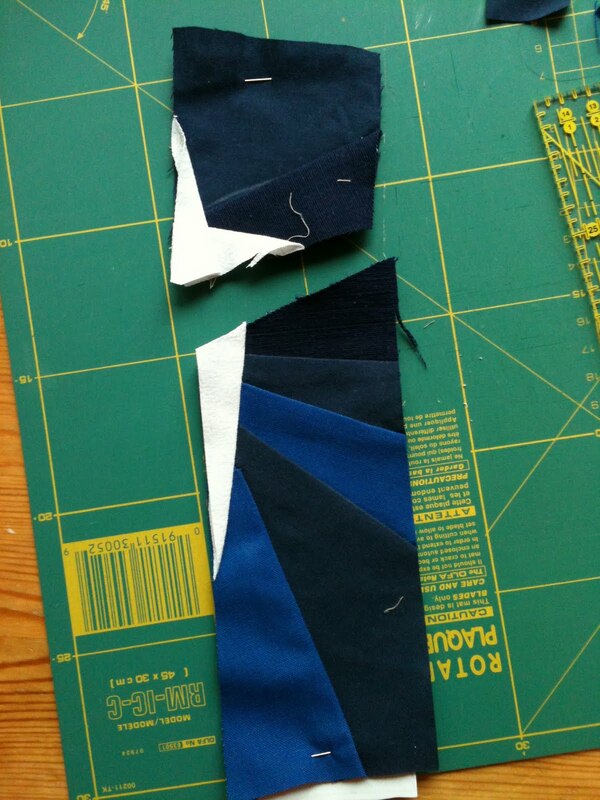 I used a left-over fabric (Ikea) with different coloured stripes, and cut them into long strips. 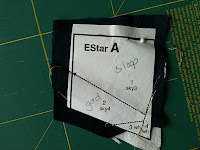 Then I cut and sew just pieces with the idea of a log cabin block. All the blocks are about 13 inches (35 cm), I want to make a few more for a picknickplaid (the fabric is very strong). So this is a good reason to go to Ikea! Allthough it's only September and not December the 2th today I made the second Nativity-block. 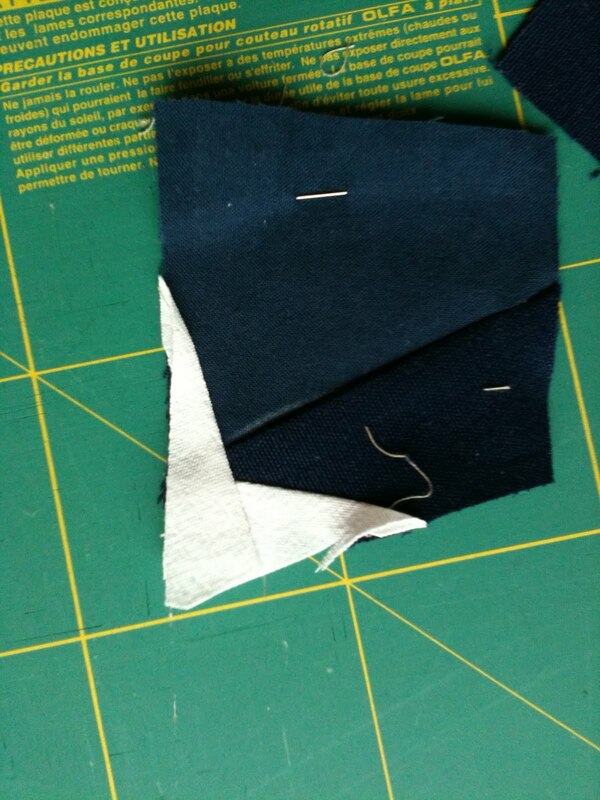 Before I started I sorted out all the fabric I need. Part of the pattern is this colourscheme, and gladly my mother had a lot of fabrics collected in the last years. There are lots of browns and greys needed, and as you can see in the picture I made a start. I've chosen all the colours that are used many times. As you see, lots of very very little pieces. 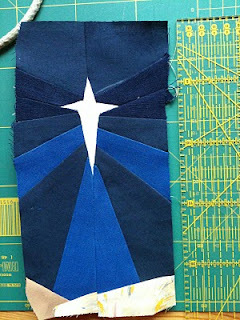 It's like a little bit of magic: sewing all those little pieces together, then attaching the different parts... and there is the shepherd! This very special man is wearing a tunica of the same fabric my mother has a blouse of... how wonderful is that! Yeah, today I finished the miniquilt with the very little baskets! 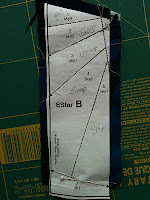 But it was a good practise and I like this not-so-useful miniquilt! Today I made the first block of the Nativity-quilt. 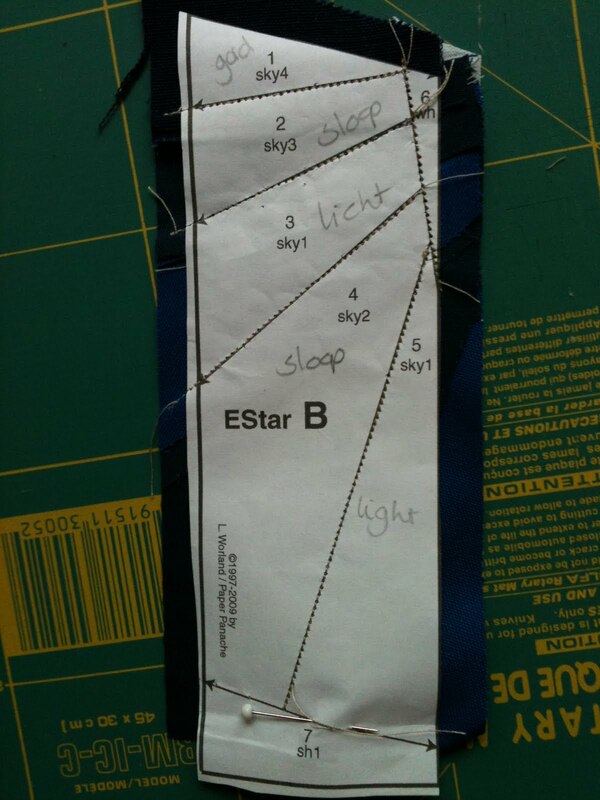 Since this is the first, I'll show the steps to make it. Here's the first part A. The second part, B shows different colors of blue, that make the star shines! The third and last part, C and D. You can also see a little piece of the shelter. The most difficult part to me was sewing A, B, C and D together. So, well, this is the first block. It's definately not perfect but hey, what really matters: the star of Bethlehem is shining! 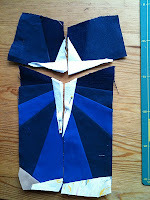 A few months ago I started with this top,made of different blue fabrics. It's almost finished, I only want to make a few more blocks on it at the long sides. I used fabric with a Delft-blue print, extra special because he was born in ... Delft. The lightblue fabric is from an old duvet cover of his parents. Nice, isn't it? I think I will quilt it with red thread, to give it a little more power. Long before I knew about quilting I liked to sew and play with fabrics. I made several plaids to use in my family. 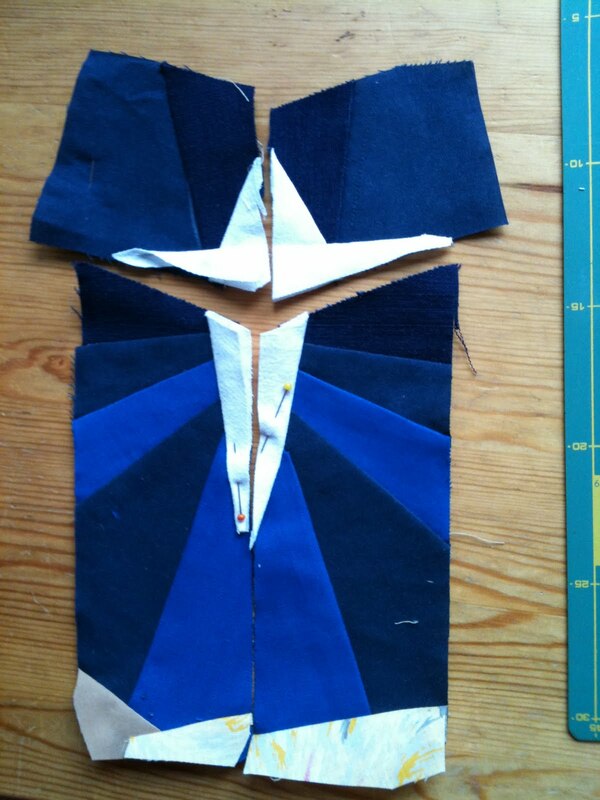 This one I made from all different pieces, cut into triangles. This next one looks a little funny, but if you think about the game Twister... yeah, you can play it on this plaid! For the backside I used all different kind of ribbons. All this fabrics are from Ikea, my favourite Swedish shop :). Thanks to my eldest son for taking this picture! He used the 1 euro-coin to show the size of the baskets. 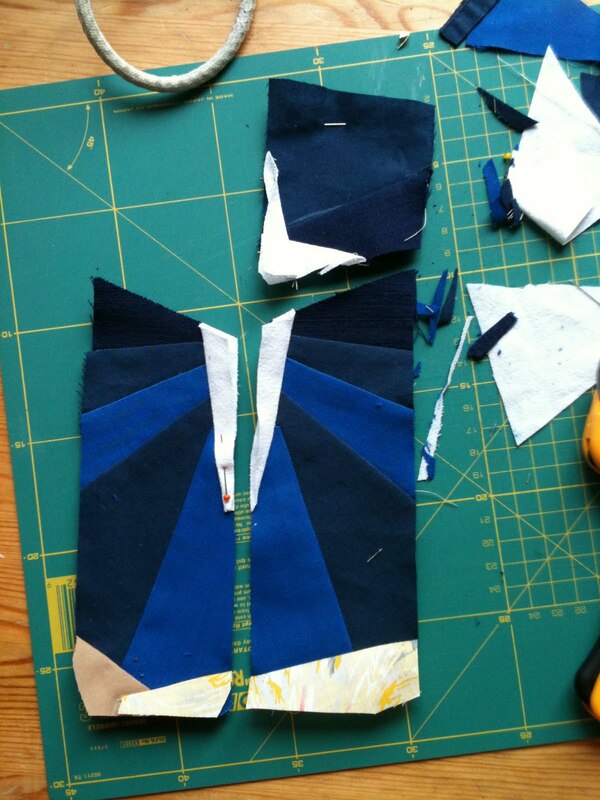 So much much more little pieces to sew... to be continued. First step is to buy the fabrics, I hope to do some shopping this weekend. My goal is to finish this before Christmas 2011 :). This week I quilted a part of the Pink&red one. For the first time I quilted together with my mum on this piece, we felt just like the women in the early days must have felt; we enjoyed it a lot! Yesterday the postman brought me the Patronenpost, with a lot of new ideas. I tried to make a few very llittle baskets (2 inches each), it's a part of a bigger block. As you see I'm still working on it and I changed the pattern a little. And pfff the pieces of fabric are really very very little! Hexagones! I haven't done anything with it yet (besides making this picture :) ) but I'm looking forward to it! Last week I made a few new crockery blocks, so now I have 16. Time to think what to do with it! I know I should have made a total design before I started anyway, but I thought I was just trying this new thing.... Well, I really learned how to make them! So now the plan is to make 4 blocks instead of the white fabric, with the 'shelves' in a third colour, and 4 or even 8 blocks for the top and bottom row. And I'm gonna change the order of the blocks, I 'm not sure I like it this way.